Microsoft announced a finalized price for the Kinect at $150. This price is pretty much what we thought it would be. They also announced a Kinect bundle which will include the Kinect, the redesigned Xbox with 4GB internal memory and the game Kinect Adventures. This smaller (memory-wise) Xbox won't look as nice as the other new ones (no shiny finish) but will still have everything you need like WiFi. I'd say this bundle is a pretty good deal all in all. Microsoft seems to have high hopes for the Kinect. It will be competing with the Nintendo Wii and also the Playstation Move (another peripheral which will debut this fall). I'm pretty stoked to try it out for myself. The bundle is tempting but I'd rather have the bigger hard drive for the Xbox so, I think I'll get the Kinect first. 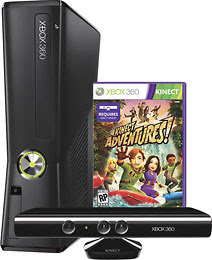 The Kinect is set to release November 4, 2010.